Posted By:Unknown | At:11:24 AM Be the first to comment! (Rolling Stone) -- Prince gave fair warning last night somewhere between his second and third encores. "Don't make me hurt you – you know how many hits I have?" 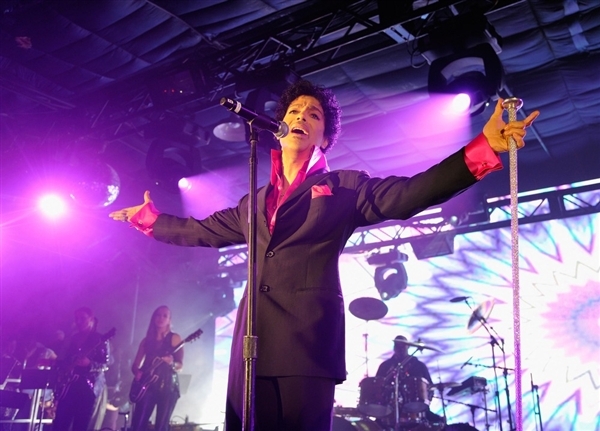 he asked the crowd packed into La Zona Rosa in Austin as SXSW drew to a close. Enough that he didn't get to them all. Not even close, in fact, though he performed for two hours and 40 minutes, returning to the stage time and again for six or seven encores in all. At a festival where special guests and counterintuitive collaborations are the currency of much-coveted buzz, Prince relied on himself – and on a band that was tighter than a Marine Corps top sheet. As much jam session for the NPG as it was a concert, Prince sang, danced, played a little piano and was generous in spotlighting his backing musicians, who included 11 horn players, two guitarists, a bass player, a drummer, a percussionist and a host of vocalists. The only thing Prince didn't do was play guitar, but then "Purple Rain" didn't include the outro guitar solo, either. He was probably just too busy directing the show, as if sampling and savoring each ingredient and adjusting to taste. The songs rarely seemed to start or stop, only to shift and flow in new directions as "Shhh" became "Musicology," which transformed into "Extra Lovable," with bursts of brass tumbling over Prince's vocals. The band did the same thing without him during instrumental sections, sliding from tight, funky soul laced with horns into an impressionistic jazz-tinted section that featured a horn solo, followed by a ripping guitar break. They stretched out on "Purple Rain," and Prince urged the crowd to sing wordless vocals in place of the guitar solo, and reflected on his career choice. "I love being a musician," he said. "It feels like a servant. A servant for you." That song ended a 50-minute main set that began with the horn players taking the stage by parading through the crowd like a New Orleans second line, and also included a ringing burst of synths and horns on "1999." For the string of encores, Prince pulled out covers of songs by Curtis Mayfield, Michael Jackson and Janet Jackson, and soul and funk workouts "like we do in Minneapolis." He dipped into Morris Day and the Time's catalog with "Jungle Love," played Sheila E.'s hit "The Glamorous Life" (which Prince wrote) and unearthed his own rarity, "Something in the Water (Does Not Compute)," singing anguished lyrics accompanied by piano on a darkened stage. Finally, as the clock ticked toward 3 a.m., Prince wrapped up, even as diehards called for one more song. A Tribe Called Quest opened the show with a set of songs that included "Can I Kick It," "Bonita Applebum" and "Award Tour." The show, dubbed "The Next Big Thing," was presented by Samsung, which gave away 200 tickets to people who used the company's tablet-like Galaxy cell phone to complete an 11-item scavenger hunt around Austin.